I'm getting font not defined. Try lcd.clear function before the lcd.print function. @heybin do you know about this bug? Will see If I reproduce the steps I took to cause the bug later. 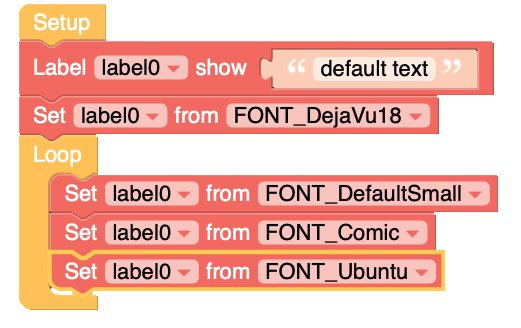 I have added a few extra font changes to trigger the bug but its the first set font that is triggering "Font not defined." Where is LCD.print in UIFlow? Is it the print block under the Text menu? @world101 lcd.print is a micropython command, you use the Label show block which is the first block I put under the setup bock in the screen grab I posted above.